Thoughtful decorating, along with an ample dose of enchantment, makes this tiny Texas home as beautiful as it is accommodating. 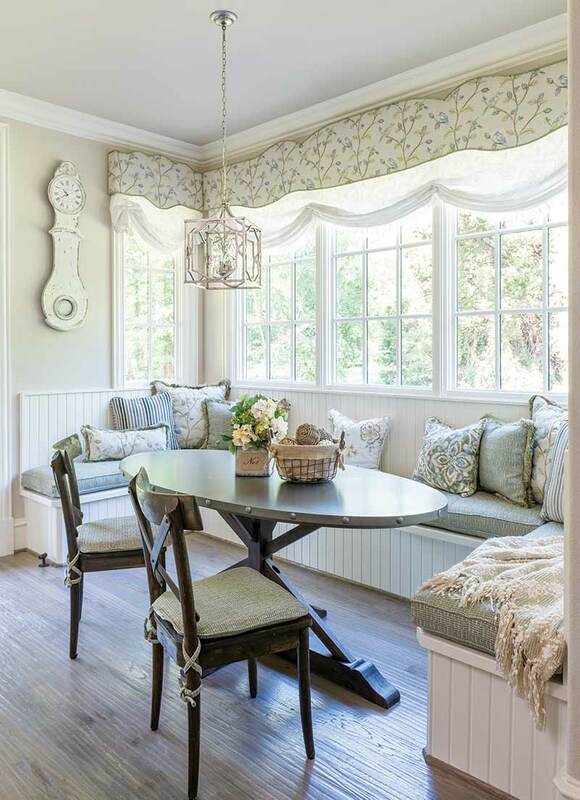 The term ‘English cottage’ conjures up quaint images of a charming abode that’s surrounded by fragrant rose gardens and nestled at the end of a meandering, stone path. 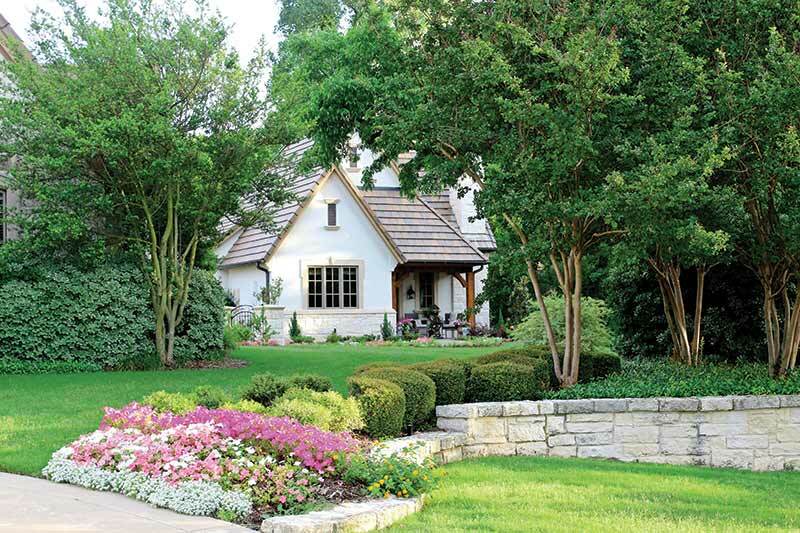 Switch the location from England to Heath, Texas, and the roses to camellias, and you’ve got the perfect description of John and Jo-Ann Arnolds’ captivating residence. 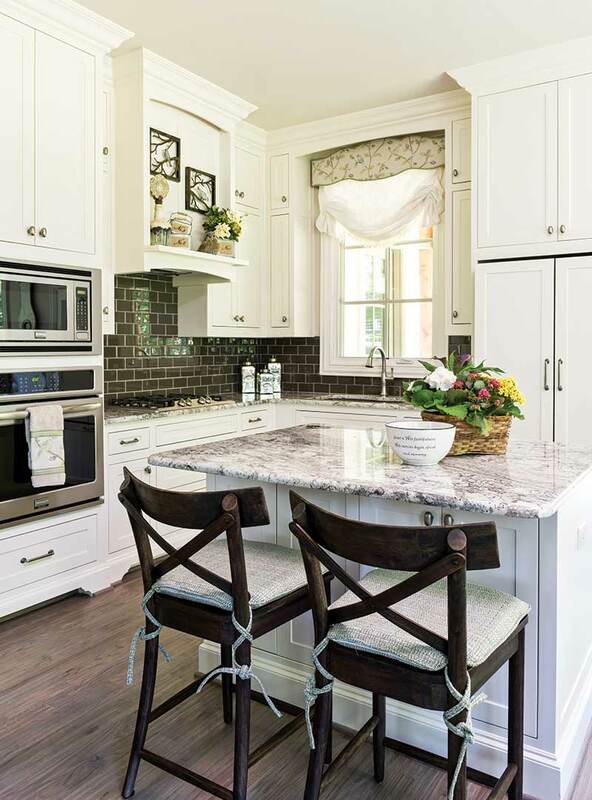 Just a pebble toss from their grandkids, the Arnolds don’t exactly live large—their place being only 1,200 square feet—yet their home’s openness and flow presents a much more expansive impression. And with features such as exposed wood trusses and a vaulted ceiling that soars to 20 feet in the living room, the entire cottage abounds with a light, effervescent demeanor. When the Arnolds’ family urged John, a former pastor, and Jo-Ann, who had been diagnosed with Parkinson’s disease, to move closer, the chief intent was to make the new house as personable and accommodating as possible. To ensure their efforts, the Arnolds turned to interior decorator Barbara Owens from Rockwall, Texas, for both help and inspiration. “I sought to create a home for John and Jo-Ann that looked as though it had been taken straight out of a fairy tale,” Barbara explains. She was also mindful when selecting and arranging furniture and accessories to keep things uncluttered and easily accessible. Since the pastor and his wife brought few furnishings with them, Barbara was basically given a clean slate to weave her design expertise. 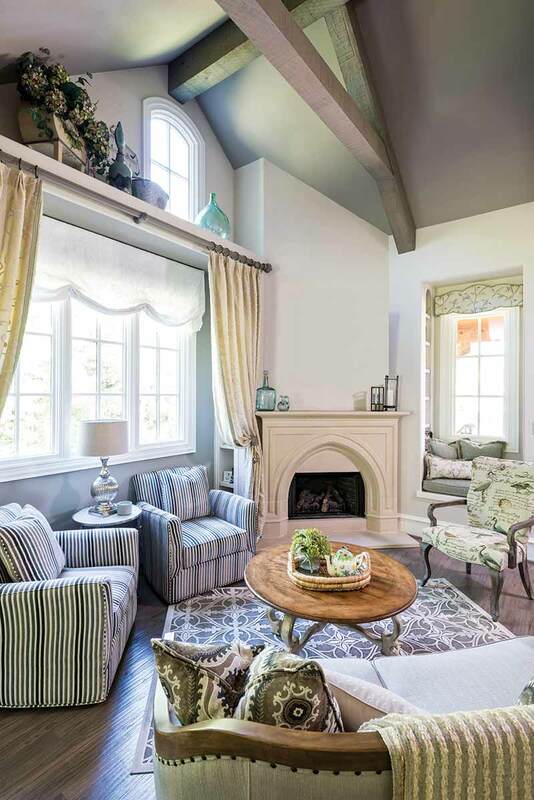 While Barbara endeavored to make the interiors comfortable and appealing, she put great emphasis on the couple’s interests and preferences as well. “I found out that Jo-Ann loves birds and the color green, and John had amassed a collection of Bibles over time,” she says. As a result, Barbara chose items such as a birdcage light fixture and pillows depicting parrots in the master bedroom. For John’s office, she designed ample bookcases to display the pastor’s array of books and family photos. There are even slender rows of shelves tucked-in on either side of the living room window seat for Jo-Ann’s sentimental assortment of tea pots and cups. And as a finishing touch, Barbara added sheer linen shades with crewel embroidery, along with cornice fabric depicting tree branches, leaves, and perching birds. 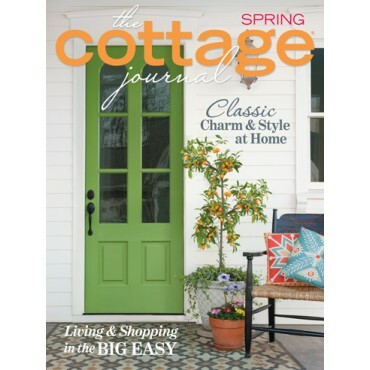 Shop the issue for more classic cottage-style inspiration!